A look at the East Coast Team in the early 2000's. Founder and CEO Mike Rosellini is on the far right. For our first employee profile, we sat down with East Coast founder and CEO Mike Rosellini to talk to him about everything from EMS, to tattoos, to CrossFit. Tell us about when you first founded the company. What were you doing at the time? What we’re you hoping to achieve? Was it difficult to get it off the ground in the early stages? 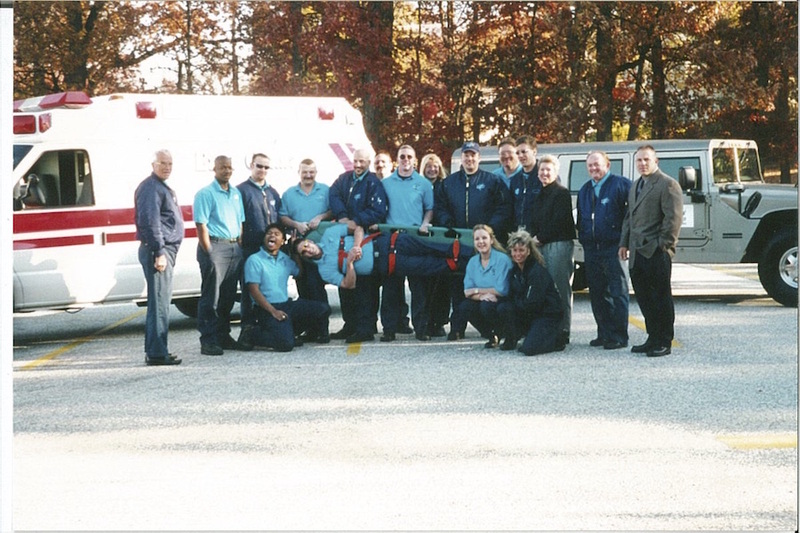 I started East Coast Ambulance in 1998 with my one other employee. At the time we were both EMT-Bs (EMT-Basic). Before I was an EMT I was a diesel mechanic. So after being an EMT-B at another company for a while, I decided to start my own business. 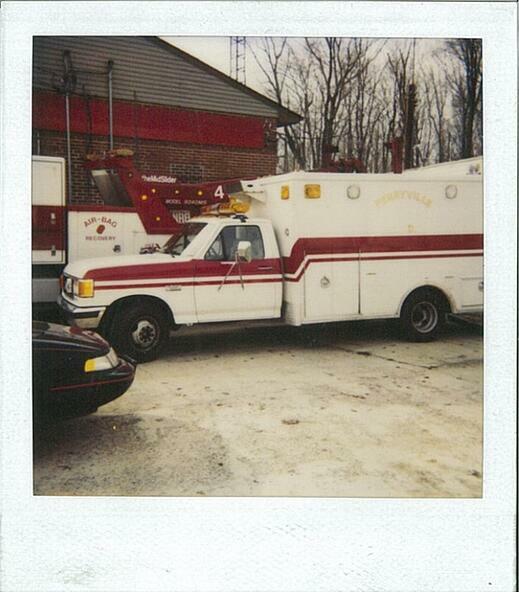 I bought an ambulance from a volunteer fire department. It was fairly run down so I fixed it up on my own and got it road-ready. So then my partner and I started driving around and doing various transports. We did it all. We would take one trip and answer our phones and jot down notes out in the field and arrange another. We slowly acquired more vehicles and continued to grow. We hired more employees and in 2002 I came off the road and started spending more time in the office. Now that we have five locations and more than 200 employees, I really play more of a managerial role. I review the data from all the locations and help handle employee issues. I really now enjoy just being a motivator to my staff. I try to motivate them every day. I see them facing the same challenges that I faced when I started the company so I do my best to support them however possible. How do you eat an elephant? One day at a time. What challenges have you faced in growing your business? I'd say the biggest challenge in growing the business has been finding quality employees, especially in recent years. In this age of social media, young people in particular are often more focused on themselves and less focused on caring for others. Finding employees who adhere to our high standards of customer service and patient care are becoming harder to find. Where do you see the EMS industry twenty years from now? Honestly, I have no idea what the EMS industry will look like in twenty years. I do know that the secret to success in any business is the ability to adapt to a changing landscape to stay relevant. That’s why our approach is different than most commercial services. Transportation is only part of what we do—we also manage transportation for our contracted facilities. We strive to be innovative in this era of cost cutting and lower reimbursements by thinking outside the box. What memories really stand out for you in the twenty years you’ve been in business? When I started out I was young and cocky and thought I knew it all. But over the years, the wise words of some of my patients remain with me. Two people in particular come to mind. I also transported another gentleman, a WWII veteran named Mr. Chase, to dialysis three days a week. He was another upbeat and happy guy, but he had a tough life. He had been shot at, blown up, and his girl had cheated on him. When he was older, the hospital damaged up his kidneys by giving him the wrong medication. You seem like a pretty eccentric guy. You own a tattoo parlor and a gym in addition to East Coast Ambulance. Can you talk a bit about how you approach entrepreneurship and what motivates you on that front? Boredom. I get bored. I also need a good challenge. Most people will be happy going home, sitting on the couch and watching a movie. Not me. Eleven years ago, East Coast was doing well and didn't require as much of my attention on a daily basis. Naturally, I wondered what else I could get into. I took a trip to Las Vegas with some friends around that time and saw Hart & Huntington, a very upscale tattoo shop. It really made me think that there would be a market for an upscale shop back home and the idea was born. Also, the TV show Miami Ink was starting to take off and tattoos were becoming more mainstream. It only took six months to go from idea to grand opening. I opened the gym five years ago, after I discovered a love for CrossFit. I have always been into weightlifting and fitness, so it was a natural progression for me to open a gym. What qualities do you value most in your employees? We hire based on attitude and personality, not just a skill set. We’ve found that you can teach someone to be a good EMT, but you can’t teach generosity, compassion, or personality. I can be a bit tough in an interview, but I lay out my expectations right from the start so there are no surprises. I also let the applicant know what they can expect from us here at East Coast. Can you tell us about how physical fitness plays into being a successful EMT? For me, a strong body and a strong mind go hand in hand. The body is a machine that, when treated well, can deliver amazing results. Everything in life begins with the mind. If you control the mind, you control the body.